Mission Bay is a large development of single family homes and townhomes west of US-441 on both sides of Glades Road. The north side of Glades Road is in zip code 33498, while the south side is in 33428. As of the end of 2017, there were 11 single family homes for sale ($389,000 to $650,000), and 5 townhomes for sale, all close to $300,000. Click this link to read our articles about Mission Bay real estate. For 2017 single family homes sold with prices ranging from $330,000 up to $652,000. Townhomes sold from $255,000 up to $315,000. Click the following to read a full report on 2017 homes sold in Mission Bay. 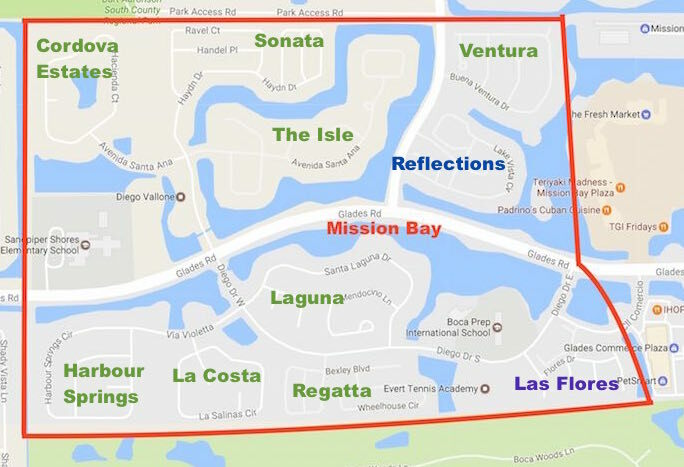 Kids in Mission Bay generally go to Sandpiper Shores Elementary School, Loggers’ Run Middle School and West Boca High School, though some of the kids may go to Waters Edge Elementary or Eagles Landing Middle, as well as other high schools. The private Boca Prep International School is also located inside Mission Bay so some kids may go there or to other private schools. Mission Bay is near the intersection of Glades and 441, with shopping plazas on each corner. The somewhat similar Loggers’ Run subdivision is to the west. Gated Boca Isles and Boca Greens are to the north on Cain Blvd. And the Boca Woods Country Club is to the south. If you’re interested in buying or selling homes in Mission Bay or elsewhere in West Boca, call Warren at 888-733-5299, e-mail him at warren@westbocanews.com, or text him at 518-225-3710.